Two-thirds scale replicas of Forbes Field in Pittsburgh, Boston’s Fenway Park, Chicago’s Wrigley Field, Tiger Stadium in Detroit, St. Louis’s Busch Stadium and old Washington D.C. ballpark Griffith Stadium are being built in Branson, Missouri, as part of a youth baseball complex opening in Summer 2015. 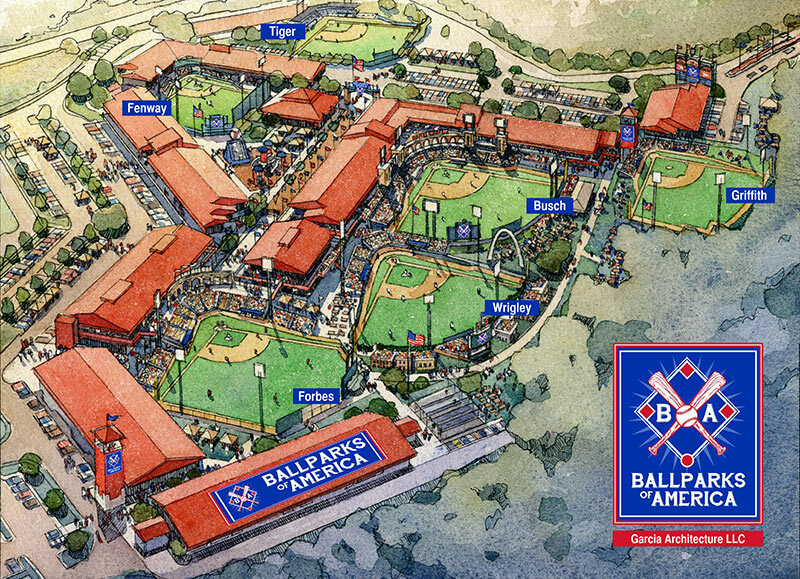 Ballparks of America as it is officially named is billing itself as “an Epcot Center of Ballparks” that will serve as an all-inclusive Baseball Resort for players and coaches from the 10U to the 13U level. According to an AP report, Ballparks of America CEO Hamilton Chang says work on the $15 million first phase is scheduled to be finished in May. It will include building six stadiums and converting part of a former outlet mall into a cafeteria and dorms for traveling teams. In future phases, developers plan to build another 10 stadiums at a cost of $9 million.